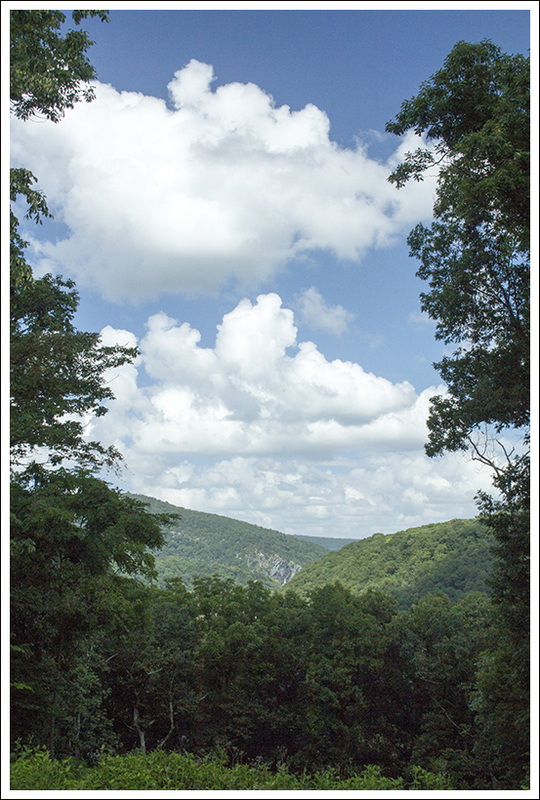 This 2.2 mile route is more of a historic stroll than a true hike, but it’s definitely worth doing if you’re in Harpers Ferry and don’t have time for more significant hikes, like Weaverton Cliff, Loudon Heights or Maryland Heights. This short hike has a lot of interesting history. 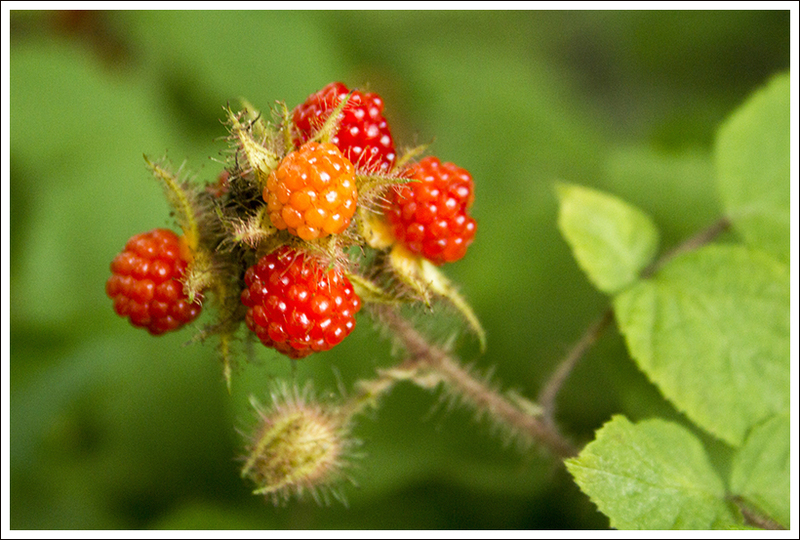 Below: Meeting Jennifer Pharr Davis, Brew Davis and baby Charley; Berries on the trail; The beginning of the route. 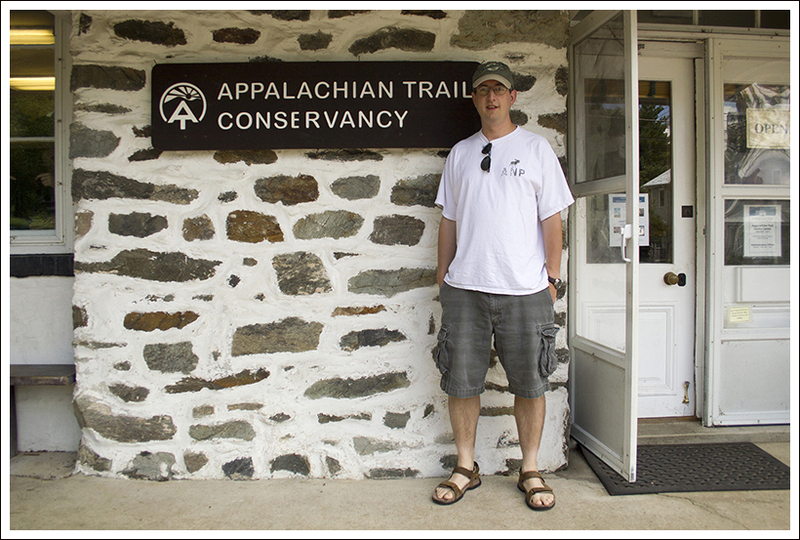 We took a trip to Harpers Ferry, WV primarily to meet Jennifer Pharr-Davis, the current record-holder with the fastest time to hike the Appalachian Trail. 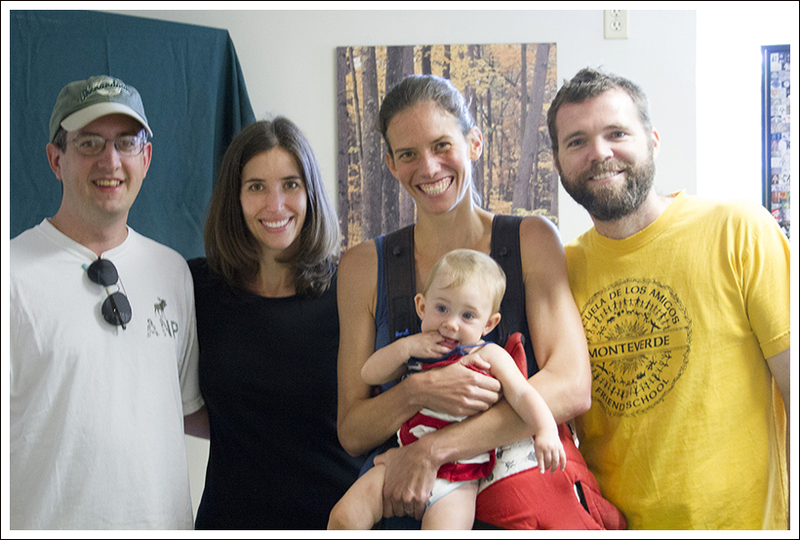 She was giving a talk at the Appalachian Trail Conservancy to promote her new book, Called Again, and talk about her experiences hiking the Appalachian Trail. The center holds archives of all the thru-hikers that have made it to this halfway point and while we waited for her talk to begin, we browsed around the center and looked through the photo archives to find some of our friends that had thru-hiked in years past. We found Jennifer’s talk to be truly inspirational and she took several questions about her experience. After leaving the center, we decided to take advantage of being in the area and headed to Harpers Ferry National Historic Park. We drove up to the Visitor Center. At the gate, there was a line of cars and one car was taking a long time to get through. While I wasn’t feeling particularly patient either, the car in front of us was shouting for the car ahead to move along. When this car finally got to the gate, they yelled at the park ranger for being too thorough with the other people’s questions. They ended up just turning around since they were too mad to enjoy the park. We felt so bad that the park ranger had to take this abuse. We paid our $10 entry fee and parked near the Visitor Center. We talked to the staff there and asked for an idea for a quick hike. 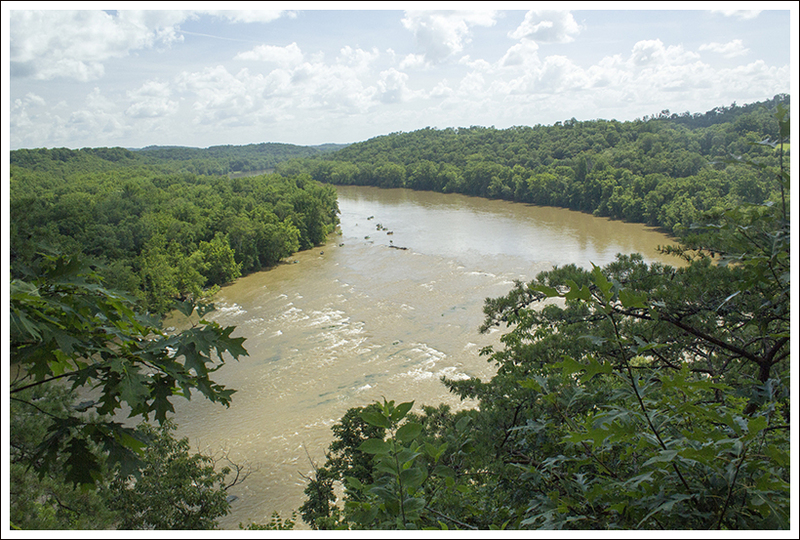 The staff member recommended this hike to us, since she said this had some of the nicest views of the Shenandoah River. We filled up our water bottles and began our hike. The temperature was scorching this day and we hit the trail in the peak of the afternoon heat. We both talked about how much we hate the heat of the summer. 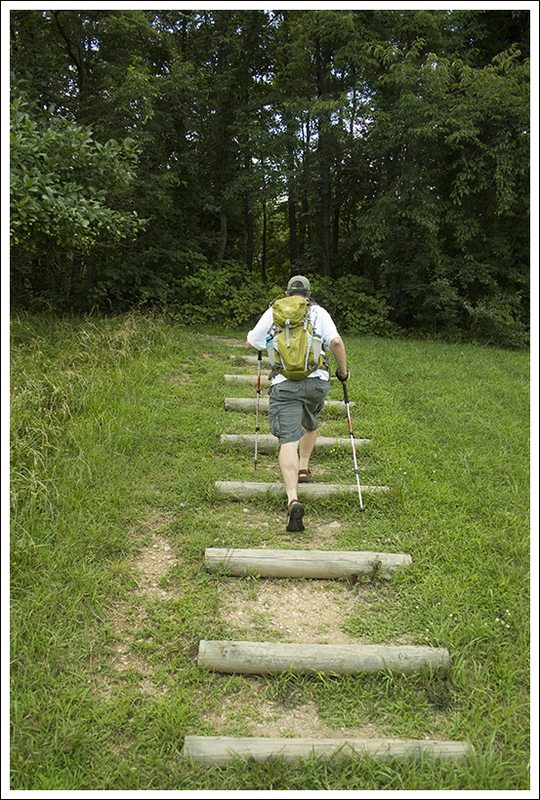 Give me fall or spring hiking days any time over humid, hot summer days. 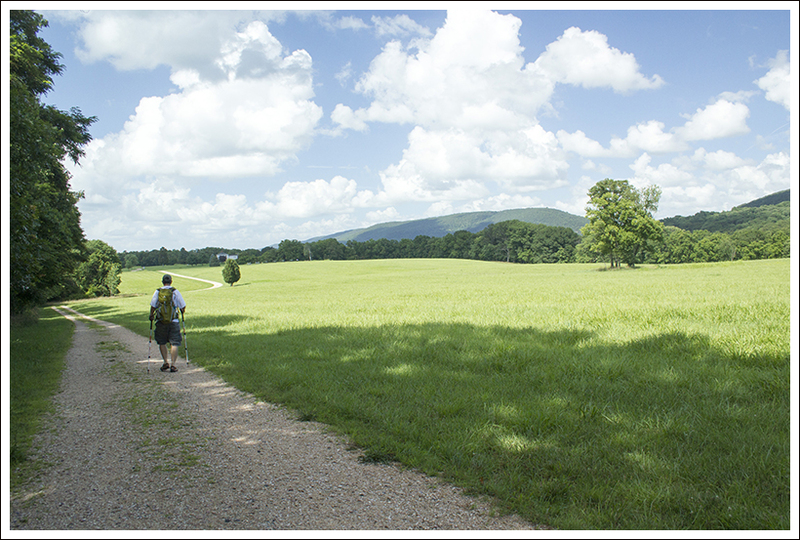 The trail starts from behind the restrooms of the Visitors Center and across the main road. As soon as you cross the cross the road, the trail bears a sharp left, skirting the tree line. The trail then goes deeper into the woods and begins a descent including a sharp switchback. At about .25 miles, the trail crosses a bridge over the small creek and then begins a short climb uphill. Once you reach the top, the trail opens up to houses on the right and a large field on the left. We took a sharp left, which hugged the tree line down a path that was cut into the tall grass. The shade of the trees gave us a little protection from the sun beating down, but it wasn’t quite enough. 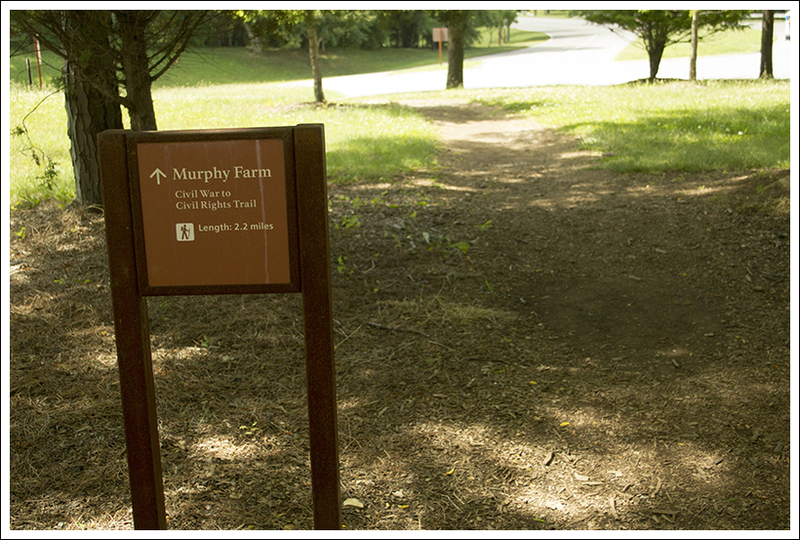 At .5 miles, the trail approaches the back of the Murphy-Chambers House. We decided to continue on and see the house on the return trip. We continued along the trail and at .9 miles, we reached the John Brown Fort foundation. John Brown was such an interesting character in American history and I remember writing a paper in college about his activist behavior. A short distance from the foundation, the trail dips into the woods for the view of the Shenandoah River. 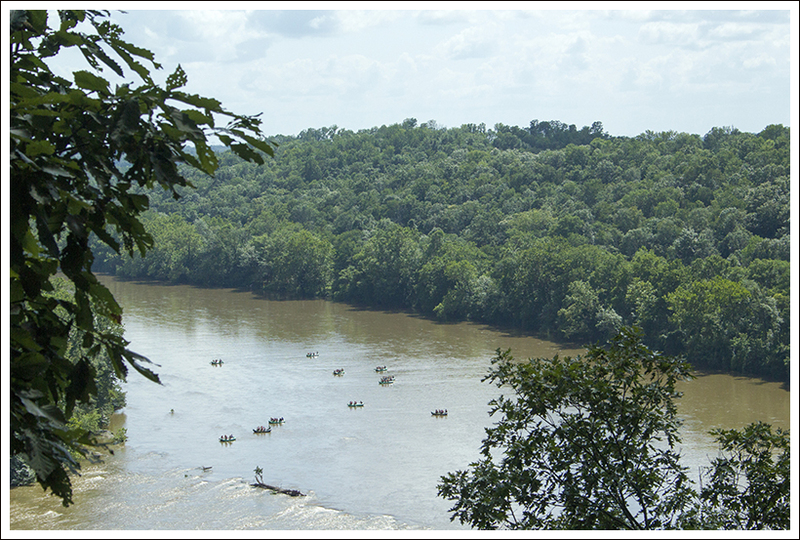 You get a nice view of the river and we weren’t surprised to see large rafts floating down the river. We continued from this point to take a right at the next junction (rather than continuing on to the earthworks) to head back to the Murphy-Chambers House. The trail follows a rather straight path and there wasn’t any shade to be found from the sun at this point. 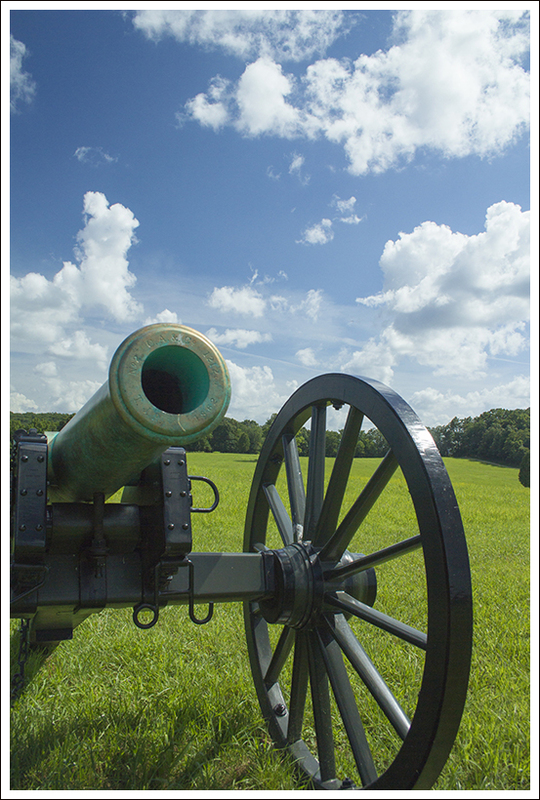 At 1.2 miles, we reached an area of cannons and learned about how Confederate General A.P. 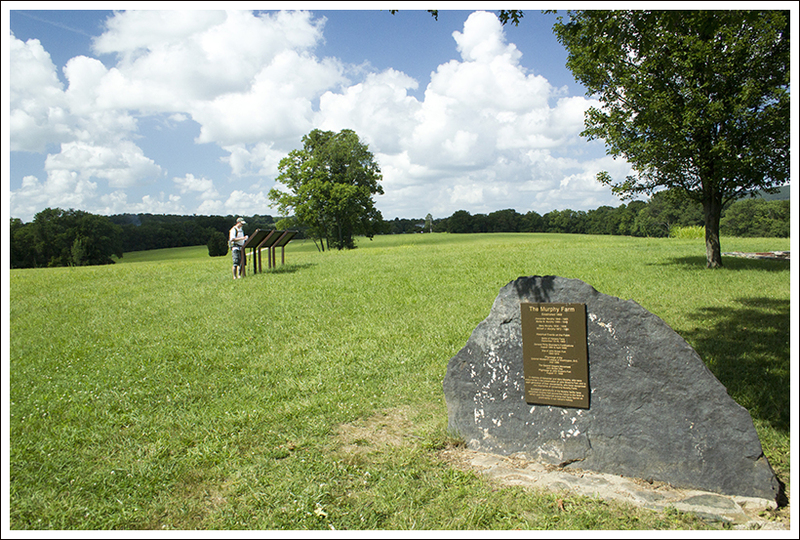 Hill maneuvered his troops to a fortified position on this hill. From here we continued on the trail which led to a gate keeping an unpaved road from going any further. There is a parking lot here and a path to the right leads to the Murphy-Chambers House. 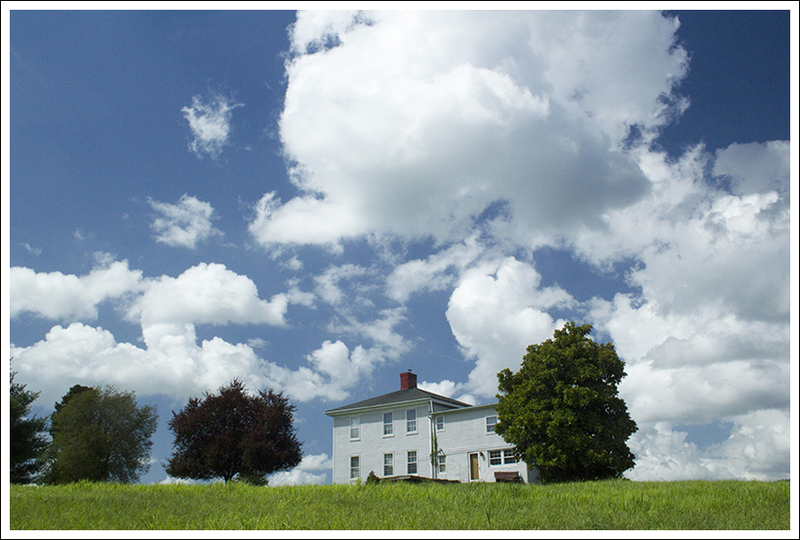 The Union took over this farm in 1862, ousting the Chambers Family. While he tried to claim restitution for his property, there is no evidence that he was ever paid. 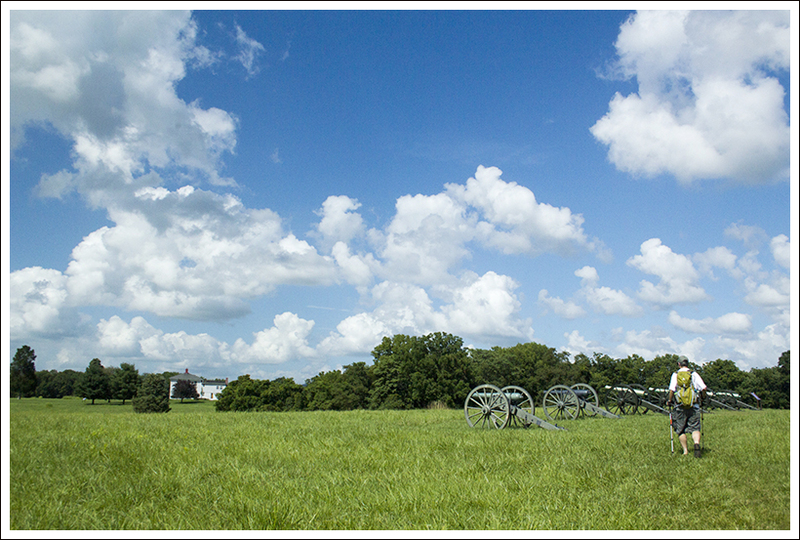 In 1869, Alexander Murphy re-established the farm. We continued along the trail on the unpaved road until we reached the junction again that led back into the woods at 1.5 miles. We followed the trail back to the Visitor Center and our car. While the day was incredibly hot, it was nice to get out and stretch our legs and learn a little about the history that shaped this area. If the weather had been cooler or if we’d had more time, we would have opted to take one of the longer hike options in the area. But after spending Saturday visiting Charlottesville-area wineries (Horton and Barboursville), touring James Madison’s Montpelier and enjoying a huge dinner at the Barbeque Exchange, we got a very late start on Sunday morning. So late, in fact, that we were worried about making it to Jennifer Pharr Davis’ talk in time. The original plan had been to have a leisurely lunch in downtown Harpers Ferry and then make our way to the ATC. As it turned out, we ended up wolfing down Subway in Charles Town and making it to the talk just in time. Jennifer’s talk was everything I hoped it would be and more! I will never be a tenth of the athlete that she is, but she inspires me to get out there and challenge myself. She loves the Appalachian Trail, and despite all the amazing places she has hiked, the AT is still her favorite. Some people might think that setting a speed record on the trail would preclude appreciating or enjoying the beauty and the experience of nature. But after hearing her speak and reading Called Again, I believe she found new levels of beauty, love, and personal fulfillment. People hike the trail for a variety of reasons – to see scenery and wildlife, to engage in self-discovery, to challenge oneself physically or to form/deepen personal relationships. Jennifer may have flown across the trail in a mere 46 days, but she still had all the experiences you would expect a person to have along the way. I really enjoyed Jennifer’s first book Becoming Odyssa, but Called Again was even more rewarding. I also added Brew Davis’ book (Jennifer’s husband) to my reading queue. I expect his side of the story to be equally fascinating! We spotted a cute fawn. Below: The return arm of the loop; Adam at the ATC. OK… now on to the hike! Adam has already done such a thorough job describing the route and points of interest, that I really don’t have much to add. I will echo his sentiments about the heat. I felt like I was going to melt into a pool of sweat on the trail. The day we were there was the beginning of one of the only really hot weeks we’ve had this summer. It was probably in the low nineties, but it was humid, windless and sunny, so the heat index was 101. I really don’t like to hike when it’s above the mid 80s, so this wasn’t a particularly fun hiking day. Even if there had been more time to explore the area, I don’t think I would have wanted to do a longer hike in this heat. Nevertheless, I enjoyed the views of the river and the historical attractions. If it had been cooler, I would have taken more time to read informational placards. My favorite part of the hike was spotting a fawn grazing in the field. From a distance, I saw a brown hump in the grass. I asked Adam, ‘Is that an animal of some kind?’. He thought it was a rock and headed over to read about the cannon on display. I tiptoed along with my camera and found that the ‘rock’ was actually an adorable spotted fawn. We made eye contact for a brief moment before he flashed his white tail and bounded off into the trees. We made our way quickly back to the car where I chugged more water and blasted the air conditioning. The outdoor temp thermometer on our car said 107. I know that was mostly from leaving the car sitting in the sun… but still! This short hike in the heat added even more to the anticipation about our upcoming ten day trip north! Our next five posts are going to be out-of-staters! We’ll be taking you to the rugged, exciting, spectacular high peaks of New Hampshire! Difficulty – 1. The trail was not very difficult and only had a little bit of elevation change on the hike. Trail Conditions – 4. The trail is well-established and didn’t have very difficult footing. Most of the trail is on grass or gravel. Views – 1.5. The views of the Shenandoah River were somewhat obstructed with trees around. Streams/Waterfalls – 2. You do get one heightened view of the Shenandoah River from this point. Wildlife – 2. I believe we were fairly lucky to see a fawn on the trail. I would expect to see field birds here for any bird-watchers. Ease to Navigate – 4. The trails mostly inter-connect here, so you shouldn’t get lost. Solitude – 4. My guess is that most people that visit the Visitor Center do not hike up to this area, but you may see some people at the Murphy-Chambers House. 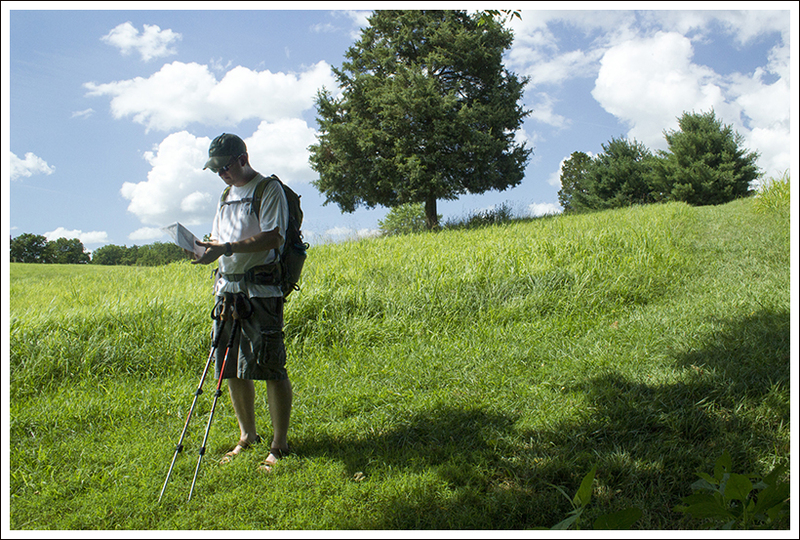 Directions to trailhead: From Charles Town, WV head north for about 4.5 miles. Turn right on Shoreline Drive (about .8 miles past Millville Road). The entrance fee station is just ahead and the large parking area is to the right. Walk up to the Visitor Center and the trail is across the road behind the bathrooms. Thanks, Chuck! I had nice skies with interesting clouds that day!